For great, high-quality tint, turn to your LLumar home window tint dealer in Bakersfield. Live more comfortably, help reduce your energy costs, and give your home an added layer of security and privacy with residential window tinting. For more than half a century, LLumar's residential window tints have offered homeowners increased protection from the sun's effects. Today, we continue to help people live comfortably in their homes, whether in an apartment, condo, or house! When you come by your home window tint installer, you'll receive the great service and respect you deserve. Visit a LLumar dealer near you for a fast and free home window tinting estimate in Bakersfield! When one of our expert technicians in Bakersfield installs your home window tint, your family is better protected from the sun’s harmful ultraviolet rays, but also from the prying eyes of would-be burglars depending on the tint you choose. 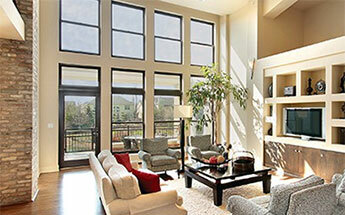 Home window tint could help keep floors, furnishings, and artwork from being damaged by the sun. It helps ward off close to 99% of the destructive ultraviolet rays that cause unwanted discoloration and fading in your home. Over the spring and summer months, it helps keep your Bakersfield home at a more comfortable temperature. Many satisfied customers have reported seeing their energy bills decrease by up to 15% once their home window tint was installed! LLumar is LEED-certified, so you could save even more money through local and national tax credits and incentives!